pressdog.com: Tracy Holding out for a "Less Crappy Crapwagon"
Tracy Holding out for a "Less Crappy Crapwagon"
Former Champ Car World Series driver Paul Tracy who famously said "I'm not gonna drive one of those crapwagons!" is now reportedly looking for a less crappy crapwagon. "There may be some things that can be done to de-crapify a crapwagon," said someone close to Tracy who asked not to be named. "Like some Corinthian leather, a cup holder, maybe." Meanwhile, fans hope Tracy will raise his level of crap tolerance and get back into the field. The spokesperson said the no crapwagon comment, attributed to Tracy on Sept. 24, 2003, was taken out of context. "He was obviously looking at some of the field fillers when he said those crapwagons," a Tracy insider said. "The word 'those' is key. He's not going to drive those crapwagons, but he might drive those other crapwagons, over there." The ability to win a race greatly de-craps a crapwagon, the Tracy insider said. Tracy was left rideless when his former Champ Car team, Forsythe Racing, shut down shortly after mergification. IndyCar Series fans were distressed at the move. Despite his "crapwagon" comment, Tracy has shown the ability to get onto SportsCenter with flamboyant actions, driving, or plain old bawls. On July 30, 2006 at San Jose, Tracy violently speared Alex Tagliani while trying to get back onto the track from a run-off. Champ Car Color King Derek Daly said at the time it "has to be the dumbest, most dangerous thing I've seen Paul Tracy do in years." Tagliani, still wearing his helmet, approached the helmet-less Tracy in the pit and informed him that "I have no f*cking cars left!" After much pushing from Tagliani and much trying to walk away from Tracy, it was go time in the pits. 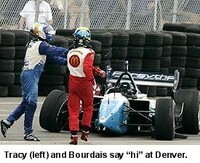 On August 13, 2006 at Denver Tracy hipchecked Sebastien Bourdais on the last lap and got into a pushing match on the track while cars were whizzing by. He later declared on live TV: "I like to see him come with his helmet off then we could have a real match. Next time he wants to come by he should take his helmet off. Those French guys like to keep their helmets on.” "
Like an estimated 897 drivers, Tracy is rumored to be holding out for a "competitive ride." An insider at Penske racing, one of those prized "competitive rides," said they receive, on average, 281 resumes from drivers every week. "We'll be glad to keep Mr. Tracy's resume on file and contact him if any crapwagon ride opens up that may fit his skills," the Penske spokesman said. Fans are urging Tracy to take whatever ride he can get. "Even last-place hockey teams need an enforcer, someone to go out there and take five for fighting when required. The fans go crazy, pounding the glass, it's awesome. The IndyCar Series could use the passion. Imagine Tracy vs. Danica at Milwaukee last year instead of Wheldon v. Danica. That takes on a whole different flavor. And Tracy instead of Sam Hornish Sr. vs. Anthony Fedele at Watkins Glenn on July 8, 2007? We're talking Espy Award here. Meanwhile, other teams in the IndyCar series have begun detailing their crapwagons, putting air fresheners in the the cockpit and fitting them with satellite radio to try and de-crapify them enough for Tracy. Some teams, perked up by Tracy's Monster energy drink endorsement, have even created "buy one, get one free" offers. "The way Tracy drives, we figured throwing in a free spare car would maybe get us into the running for his sponsorship money -- er -- driving services," said a non-competitive team spokesperson. So far no word on whether Tracy will find a ride before the season opener at Homestead. In other news, the Indianapolis Star reported today that the merger of Champ Car and the Indy Racing League appears imminent. Since we know Firestone tested white wall tires earlier this year, can we go the full route with a Rich . . . Corinthian . . . Leather driver's seat, white wall tires, wire wheel covers, padded vinyl airbox cover (landau irons optional), and opera lamps for night races? From a crapwagon to a "Stylin' Mo-sheeen" for Mr. Tracy. Or will a set of gold double dubs work for The Thrill from West Hill? "Every day, Paul be hustlin'"
Get the Indy Inside Scoop! Your e-mail address won't be shared/sold/rented/loaned etc.